A stroll in the park . . . | A balanced diet . . .
Croome Court, some 20 miles south of our home in Bromsgrove, and nestling beneath the Malvern Hills, is one of our ‘local’ National Trust properties. In fact, it was the second property we visited, at the end of March 2011, just after we’d become members of the National Trust. And a couple of days ago, on a very bright but cold morning, we made our fifth visit to Croome. The ideal setting for a bracing walk, and not only to recover from some of the excesses of Christmas, but also take a peek inside the house since we’d not done that since 2011. We can see the Malverns from Bromsgrove, and there is often a clear view south down the valley of the River Severn near Croome, with the Costwolds outlier of Bredon Hill on the east side and, more spectacularly on the west, the line of the Malverns stretching some eight miles north to south and separating Worcestershire from Herefordshire. 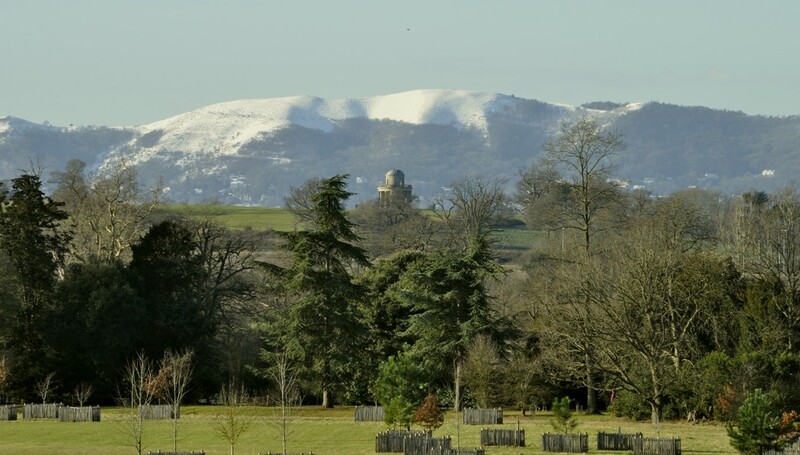 As we drove south along the M5 motorway I wasn’t expecting to see the Malverns as we did that morning, covered in snow, and looking even more stately, impressive, and higher than we normally see them. What a surprise! Once at Croome, we had magnificent views of the whole line of hills due west. The snow had somehow ‘etched’ new landscape perspectives that we’d never observed before. The magnificent Malvern Hills, looking more like the Alps than a modest range of hills on the Worcestershire-Herefordshire border. The northern end of the Malverns, with Croome’s Temple Greenhouse on the far right, and the Croome River snaking past trees towards the left. The Panorama Tower has a view westwards towards the Malverns, and east towards Croome Park itself. It lies about 1 mile as the crow flies due west from the house. First things first, however. We arrived just after 10:45, after a 30 minute drive from home. Fortunately although the night before had been very cold, with a little dusting of snow and some icy patches on rural roads, we did not encounter any holdups at all. Nevertheless, the first place we headed to was Croome’s 1940s-style canteen to enjoy a cup of frothy cappuccino to set us up for the walk around the park. In the past we’ve taken in the whole circuit of the park, to the far end of the Croome River (see map). 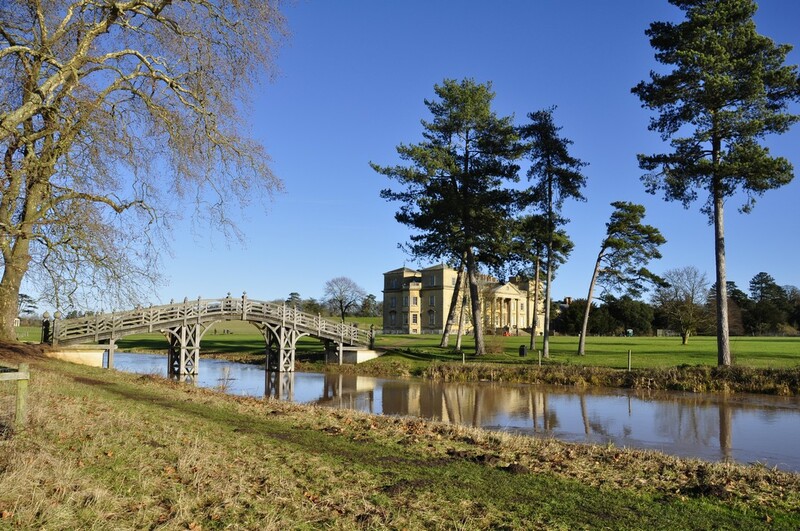 But on this day, we walked as far at the Island Pavilion (21 on the map), and back along the far side of the Croome River to the Chinese Bridge (16). After touring the house, we headed to the Rotunda (13) and along the east side of the Walled Garden to exit through the Visitor Centre. It was a walk of around three miles, and most welcome. The winter walk . 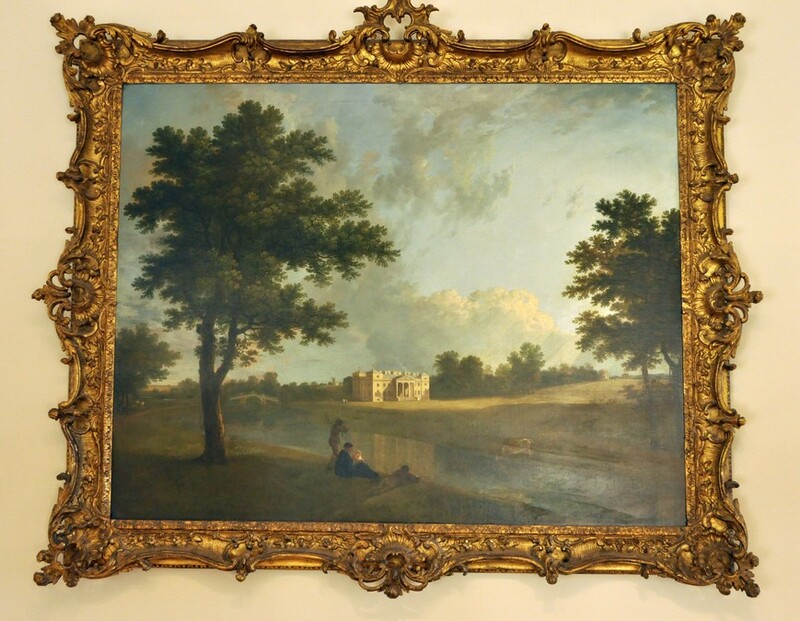 . .
A painting by Richard Wilson in 1758 is on display in one of the ground floor rooms. Not much has changed in the intervening 260 years. Since our first visit, the main entrance to Croome Court is now through the Hall on the north side of the building. Inside, there are few significant changes from our last visit, although I think there were more rooms open on the first floor. The Robert Adam ceiling in the Long Gallery is a sight to behold. The decorated plaster-work of the dining room is as delightful as ever, likewise the main doorway and ceiling of the Saloon. The bare wooden walls of the Tapestry Room are testament to what was; the tapestries now hang in the Metropolitan Museum in New York. The wallpaper in the Chinese Bedroom on the first floor caught my eye, as did the portraits of the 9th Earl of Coventry and his wife propped up against the wall of an adjacent room. Two exhibits stand out above the others. I love porcelain, and in the dining room there is a stunning exhibit, The Golden Box (designed by Dutch artist Bouke de Vries, whose War and Pieces we saw at Berrington Hall in April this year), of some of Croome’s porcelain. The Golden Box took my breath away. On the first floor, in what was Lady Coventry’s Dressing Room, is the recently opened ‘I AM Archive’, a vortex construction that will eventually house information and documents about Croome. A truly inspirational design. Finally, it was outside again through the doors of the Saloon, and on to the south-facing steps flanked by two sphinxes. In the early afternoon sunshine, the light coloured stone of the façade glowed a deep gold. At the Rotunda there was a good view over much of the park to the west and south. Croome was heaving with visitors, all taking advantage of the lovely day, many following children along the ‘Gingerbread Trail’, or taking dogs for walks in the park’s wide open spaces. Everyone seemed to be having fun, as we did, and we look forward to our next visit some time during 2018. This entry was posted in Out and about and tagged Bouke de Vries, Croome Court, Earl of Coventry, National Trust.